The opening of Roswell’s new Fire Station #4 is a great achievement for our city—the culmination of a vision and many years of team work by our fire department, city officials, and the design and construction teams that brought the new facility to life. It is also a milestone for Public Art in the City of Roswell. The Bucket Brigade was the outcome of the first official Public Art process in our city. For members of the selection panel, it was not the work we thought we were going to choose – – but then something transformative happened. First, Peter Reiquam began to describe the concept for the sculpture as it represented the history of firefighting, the spirit of community, and the inspiration he found in our historic sites and the waters of our beloved Chattahoochee River. Then, Tony, a member of our selection panel and a voice for the professionals who would “live” with the selected work of art—related the camaraderie among firefighters in friendly “bucket brigade” competitions designed to test teamwork and physical conditioning. Suddenly, we could understand the history of firefighting and firefighters, neighbors working side-by-side, passing water from one to another to extinguish a fire that threatened lives and homes and land. We could imagine members of a long-ago community, dropping whatever they were doing to join in a line to pass water from a well to put out a fire. This focused and careful movement of people, working to keep the water in the buckets as it moved from one to the next, demonstrates the sense of community and teamwork that embodies firefighting, and illuminates water as life-giving and life-saving. It is story that represents members of a community working together toward a common goal. We could envision this story being animated for visitors, especially preschool children who are fascinated with fire engines. Students could see history coming to life and imagine the roots of firefighting before there were pumper trucks and fire hydrants. We could picture the photo opportunities with families, and selfies be shared on social media. It was magical.  The selection of the Bucket Brigade is exactly what public art should do —tell a story; inspire learning and curiosity; create a sense of place; serve as a source of pride for its residents. Peter Reiquam is a Seattle-based artist who has been creating large public works that tell a story for over 20 years. His site-integrated works often use a representation of familiar objects as a device for viewer interaction. Peter received his MFA in sculpture from Yale University. Among his many award and honors, Peter’s Nine Lives (a large cat that watches over a fire station in Seattle) was named one of the best works of public art in 2015 by Americans for the Arts, and The Empty Chair received the same recognition in 2014. We’re honored and excited to have Peter’s work showcased at Fire Station #4, and we thank you, Peter, for sharing your artistic vision and your magic. 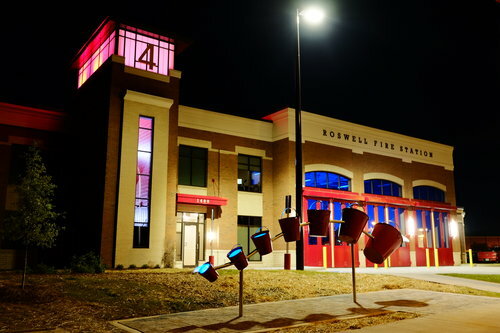 The Roswell Arts Fund and the Public Art Selection Panel is thrilled to have played a role in this milestone event, and we wish the residents of Fire Station #4 good luck and congratulations in their new home. This post is based on remarks made at the dedication of Fire Station #4 on April 20. PrevIs it a Bridge? Streetlamp? Stairs? Art? It’s Both!